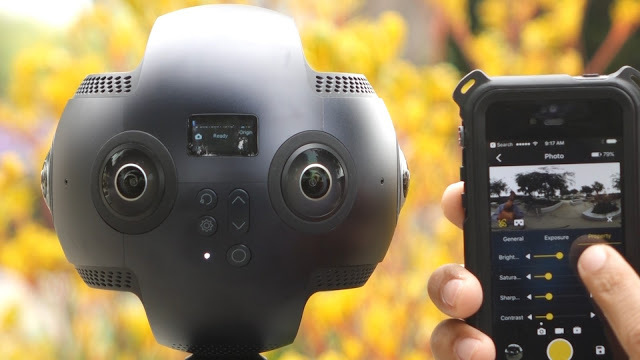 Insta360 is working on an update to enable the Insta360 Pro (reviewed here) to stitch its 8K and 6K 3D 360 videos in-camera with optical flow stitching, using its own graphics processor. And here’s the kicker: it’s processor is so powerful that it might stitch faster than some PCs. Insta360 Pro is a professional 360 camera that can shoot 8K in 2D 360 or 6K in 3D 360, or live stream in 4K in 2D or 3D. Not only does it offer very high quality 360 videos (and photos), but it is unique in being incredibly integrated and easy to use — almost as easy to use as a consumer 360 camera. Thanks to a very powerful processor, it can also perform feats such as simultaneous live streaming while also recording the stream with realtime stitching, and concurrently saving separate unstitched videos for each lens. See my live streaming tutorial. Now Insta360 is working on using the Pro’s processor for in-camera stitching. While the Pro has always had 4K realtime stitching capability using template-based stitching, the update would enable the Pro to stitch even 8K or 6K 3D 360 videos in-camera with optical flow stitching, which until now had been possible only on a desktop. The idea is that you’ll be able to use the Insta360 Pro to stitch its videos for you before you get back to your office or home, or it can serve as a second stitching station. I’m really looking forward to this update, which would be a tremendous convenience and a huge time saver. Insta360 Pro said they are planning to enable the update in October. Insta360 had no comment on whether they are also working on an update to enable the Insta360 Pro to fold your laundry and cook dinner for you. If you’d like to get the Insta360 Pro, contact me so I can help you get an exclusive discount for 360 Rumors readers and viewers! Alternatively, you can order the Pro from Amazon (Listing #1 or Listing #2) or B&H Photo where it is now in stock (at the time of this writing). That does sound good. Will be good to have that option though it can be a time issue considering if you are out in the field waiting for the stitching to happen and not being able to photograph. On a unrelated topic, has anyone had any issues with their display? Mine seems to be playing up since the 160 update. Yi 360 VR is compatible with Google Street View Mobile!